Millions of litres of water spilled into the dry riverbed below the wall of the Naute Dam near Keetmanshoop when the floodgates were opened earlier today after the floodwater from the Löwen River that feeds into it, filled it to capacity. At the time when the floodgates were opened at around midday on Monday the dam was over 103 percent full. During the weekend the water level rose from 61 percent to well over 95 percent in a period of 48 hours. By Sunday evening the dam was already 99, 4 percent full while water flowed into it at a rate 70 cubic metres per second. 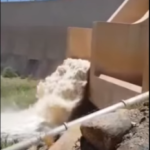 Andre Mostert, NamWater’s manager of hydrology, said the flood gates were open for about six hours until the water level in the dam went below 100 percent. The safety cut-off point for the Naute Dam is 103 percent. He said the last time the floodgates at the Naute Dam were opened was during January 2016. Residents of Keetmanshoop as well as a group of school children gathered at a special look-out point below the dam wall to witness the spectacle of millions of litres of water spilling into the dry riverbed of the Löwen River.